Posted on February 16, 2019	by E.J. Let us listen to what Jesus tells said about death – the one who knows better than anyone. Posted on January 29, 2019	by E.J. 1 Corinthians 16:22 “If anyone does not love the Lord, Jesus Christ, let him be accursed. Maranatha!. Maranatha is an Aramaic (the native tongue of Jesus) word which means “the Lord is coming” or “come, O Lord.” The early church faced much persecution under Roman rule. The Romans required everyone to declare that Caesar was god. The early Christians knew that there is only one God, the Father and one Lord, Jesus Christ, His Son, and in all good conscience they could not call Caesar “Lord”, so the Romans, viewing them as traitors, persecuted and killed them. Living under such adverse conditions, the believers’ morale was lifted by the hope of the coming of the Lord. “Maranatha!” became the common greeting of the oppressed believers. Today we live our lives in the light of the knowledge that Jesus can appear at any time, and that we are to be ready. Every day we should expect His appearance, and every day we should long for Him to come. Maranatha reminds us to keep our eyes on the eternal things of the Spirit. To dwell on material things is to be in constant mental turmoil. Looking down, we see the earth; looking around, we see earthly things. But looking up, we see the hope of the soon coming of our Lord Jesus Christ. To those who are discouraged today, Maranatha! To those who are worried today, Maranatha! To those who are filled with anxiety over the problems they are facing, Maranatha! Our Lord is coming! Posted on January 5, 2019	by E.J. To all who desire greater health, or freedom from debilitating health conditions, fervent prayer may help, or it may not. If we are praying for God to heal us from conditions we have brought on ourselves by following the leadings of Satan and the world rather than the Word of God and the health message Our Heavenly Father specifically gave the remnant church, we may have tied God’s hands in His ability to heal us. If we are following the enemy, wittingly or unwittingly, and not Him, we have placed ourselves under the dominion the god of this earth who wants to destroy us, not God Almighty who wants to heal us. This is a series of health evangelism messages that are excellent, and worth listening to, even if you are in excellent health, because it will help you help others who are not. As John said in 3 John 1:2 “Beloved, I pray that in all things thou mayest prosper and be in health, even as thy soul prospereth.” If our souls aren’t prospering by the power of the Spirit of God dwelling in us, we are not equipped to be in health and prosper in all things. In Ezekiel 33:11, God says to the Church: “Say unto them, As I live, saith the Lord GOD, I have no pleasure in the death of the wicked; but that the wicked turn from his way and live: turn ye, turn ye from your evil ways; for why will ye die, O house of Israel?” We are the spiritual house of Israel, and He is pleading the same with us today. To prosper and be in health, our soul must prosper. For our soul to prosper, we must overcome sin. We can only overcome sin by the power that worketh in us. We are called in these days to be they who keep the commandments of God and have the testimony of Jesus. Do we truly have the testimony of Jesus? What could an Unsanctified Man do in Heaven? Posted on November 14, 2018	by E.J. Most men hope to go to Heaven when they die; but few, it may be feared, take the trouble to consider whether they would enjoy Heaven if they got there. its occupations are all holy. To be really happy in Heaven, it is clear and plain that we must be somewhat trained and made ready for Heaven while we are on earth. We must be saints before we die–if we are to be saints afterwards in glory. we need to be sanctified–as well as to be justified. What could an unsanctified man do in Heaven, if by any chance he got there? No man can possibly be happy in a place where he is not in his element, and where all around him is not congenial to his tastes, habits and character. then, and not until then, will I admit that the unsanctified man could be happy in Heaven! Suppose for a moment, that you were allowed to enter Heaven without holiness. What would you do? What possible enjoyment could you experience there? There will be none such in Heaven! Now perhaps you think the that saints of God too strict and particular and serious. You rather avoid them. You have no delight in their society. But there will be no other company in Heaven. Now perhaps you think that praying and Scripture reading and hymn singing–are dull and melancholy and foolish; a thing to be tolerated now and then–but not enjoyed. You reckon the worship a burden and a weariness. But remember, Heaven is never-ending worship. The inhabitants thereof rest not day or night, saying, “Holy, holy, holy, Lord God Almighty,” and singing the praise of the Lamb. How could an unholy man find pleasure in occupation such as this? It seems clear that Heaven would be a miserable place to an unholy man! We must be heavenly-minded and have heavenly tastes in the present life–or else we will never find ourselves in Heaven in the life to come! Posted on October 15, 2018	by E.J. Many of you know more about your magazines and novels–than what God has written in His holy Word! Many of you will read a novel from the beginning to the end, and what have you got? A head full of froth when you are done! But you cannot read the Bible–that solid, lasting, substantial, and satisfying food goes uneaten, locked up in the cupboard of neglect–while anything that man writes, a best-seller of the day–you greedily devour! Posted on September 30, 2018	by E.J. 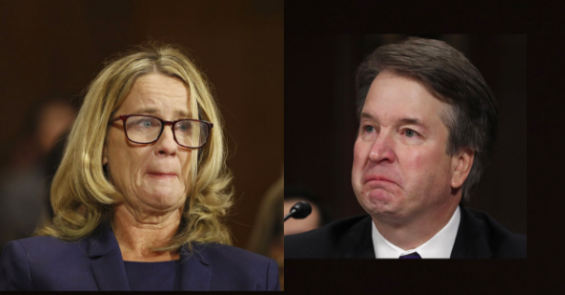 “He did it!” she said under oath. “I didn’t!” He fired back under oath. The fact is: both can’t be right. Somewhere, the TRUTH EXISTS about what really happened 36 years ago. Hopefully, the FBI investigation will uncover it. Without wading into partisan politics, I want to stress to all of my readers that this whole controversy (if you are watching it) is a lesson revealing that truth isn’t relative, as so many mistakenly claim today. That it is an illusion. The fact is that truth does exist. “What is truth?” Pontius Pilate asked Jesus Christ (John 18:38) during His trial. This was a great question, but then HE WALKED AWAY from THE ONE WHO IS THE TRUTH. Let’s be careful. Let’s not make the same mistake of claiming to be looking for truth today, but then avoiding it when God shows it to our consciences. Jesus Christ is the truth (John 14:6). God’s Word is truth (John 17:17). The Holy Spirit is “the Spirit of truth” (John 16:13). His law is the truth (Ps. 119:142). In this time of raging controversy, may God help us not to be deceived away from Jesus Christ and His Holy Spirit, His Word, and His Law. There’s another lesson I want to stress, especially for “the remnant” people of God who who seek to “keep the commandments of God” and hold to “the testimony of Jesus Christ” (Revelation 12:17). During earth’s final crisis (see Revelation 13:16,17; 18:1-4), the world’s spotlight will be on us. I hope we realize that. At that time, make no mistake about it: we will be fully investigated. Every position we hold, every doctrine, and every life practice will be scrutinized. Every slander and false accusation will also be thrown against us, as were heaped upon our Master, Jesus Christ. Yet Jesus was innocent and blameless. All accusations were false. In that storm, the Father stood by His Son. And after Jesus died, God raised Him triumphantly from the dead (Matthew 28:1-8). What about us? Now is the time to confess every sin. Now is the time to make sure we have no skeletons in our closets that might be revealed under intense investigation. By God’s grace, we must “become blameless and harmless, children of God without fault in the midst of a crooked and perverse generation, among whom you shine as lights in the world” (Phil. 2:15). Brother’s and sisters, it’s time to pray, to humble ourselves, to meditate much on God’s Word, to seek Jesus earnestly, and to trust Him fully. Let’s learn these lessons from The Kavanaugh/Ford Controversy.